Australian Unity is Australia’s largest ‘not for profit’ health fund in Australia. They offer health insurance as well as a range of other financial services. Why Choose Australian Unity Overseas Visitor Health Insurance? Any working visa that has the requirement of “adequate health insurance” will be met with Australian Unity’s working visa cover policy range. Their policies adhere to the requirements of popular visa subclasses from the 457 visa to the 485 visa. When you purchase an Australian Unity overseas visitor health insurance policy you receive an instant insurance visa letter which you need to attach to your application. Unlike some other funds such as IMAN, Australian Unity allow you to mix and match your overseas visitor health cover. For example, you may choose to have their cheapest policy “budget workers cover” and then combine it with their most expensive extra’s cover (comprehensive extras). Extra’s is cover for non-hospital items such as dental, physio and optical (eg getting a new set of prescription sunglasses). Australian Unity is one of the only health funds offering overseas visitors preventative health benefits. This only only is applicable for their mid-level health cover and includes doctor health checks, weight loss programs, personal health coaching etc. They also have health support programs such as a health heart program and integrated care program. Why Not Choose Australian Unity Overseas Visitor Health Cover? Australian Unity does not offer the cheapest overseas visitor health cover. 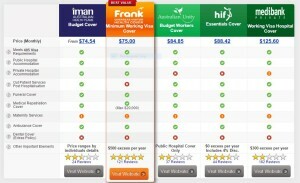 The below overseas visitor health insurance comparison table shows that Frank offers the cheapest policy. If your looking just for the cheapest overseas visitor health insurance then Australian Unity is not the cover for you. Below you can see how the overall score is 1.9 (36%) which is higher then Medibank but lower than Frank, HIF and IMAN. You can read the reviews through the widget below. It should be noted that these reviews will be a mix of those who have purchased Australian Unity overseas visitor health cover and permanent residents who have purchased their regular cover. Australian Unity’s budget worker cover only allows you to be treated in a public hospital for a range of treatments. Their more premium policy “workers cover plus” also covers you in public hospitals as well as agreement private hospitals. This means that you can’t get treated in any private hospital but only at selected practices. It’s critical for someone considering purchasing this policy to understand where they place to live and what agreement hospitals (if any) are located in the vicinity. If your treated in a private hospital that doesn’t have an agreement you may either be out-of-pocket for some expenses or not covered at all. Australian Unity is a great choice for those looking for overseas visitor heath cover from a trusted ‘not for profit’ brand. If you want to tailor your cover with some extra’s (eg Dental) then this is the insurer for you. On the other hand, if your looking for the cheapest overseas visitor health cover or a premium policy you may want to review your other options on our overseas visitor health insurance comparison table before you buy. Remember, you can always switch Australian health funds (or policies) once you arrive in Australia if you find the policy or fund isn’t right for our circumstances without any visa issues, just make sure your always covered!